You are here: Home / Reviews / Book Reviews / What Has More Energy? A 3 ½” 12 Gauge Buckshot Load or a Throat Punch By Mike Tyson? Not because I’m some sort of genius, but because I met the guy who HAS found all the answers at this year’s Professional Outdoor Media Association (POMA) Conference. His name is Andrew and he created the Cartridge Comparison Guide, now in its second edition. Question: Is the muzzle energy of the Winchester 12 gauge, 15 pellet, #00 buckshot, 3 ½” load more or less than getting punched in the throat by Mike Tyson? Answer: It’s a trick question. While the muzzle energy of this load is 3,780 foot-pounds, you can’t really measure the impact of a Mike Tyson throat punch as he prefers 7 punch combo’s led by a jab. Question: Which has a greater sectional density? The .577 Nitro Express Barnes Bullet or Rosie O’Donnell? Answer: Aha! Tricked you again! You can’t accurately compare the .577’s sectional density of .313 with infinity! Question: Which requires more energy? Stopping a .35 Whelen 200 grain projectile once it has traveled 300 yards or prying Lindsey Lohan from a one of Hollywood’s Hookah Lounge bar stools? Answer: Well, according to the Cartridge Comparison Guide, a .35 Whelen 200 grain projectile will be moving at about 1,916 feet per second at 300 yards, which translates to, let’s see, carry the one, 1,630 foot-pounds of energy. As of last reports, officials still have not managed to pry the wayward actress from her bar stool, so we’ll have to get back to you on this one. Question: What exerts more force? Martha Stewart hot-glueing doilies onto a festive holiday wreath or the recoil of a .221 Remington Fireball? Answer: The .221 Remington Fireball with a 40 grain Hornady projectile exerts about 1.62 foot-pounds of recoil, while sticking doilies only requires .731 foot-pounds using general purpose hot glue. Question: OK, last chance to improve your score. Which of the following is more likely to create a tear-drop or bell-shaped wound channel? The .17 Remington Fireball 20 grain bullet or Louie Anderson hitting the water from the 5 meter board in ABC’s new celebrity diving show, Splash? Answer: Due to its 4,000 feet per second velocity and light bullet construction, the .17 Fireball is likely to fragment, thereby creating a tear-drop shaped wound channel. Louie Anderson, currently weighing in at 400 pounds, is likely to empty the pool, rendering wound-channel measurements impossible. Of course, if you want to do more mundane things like find the best hunting cartridge that will minimize felt-recoil, while delivering a certain amount of energy at 300 yards, the Cartridge Comparison Guide will help you do that too. It’s chock full of tables that rank and sort data like bullet weight, muzzle velocity, down range energy, bullet momentum, sectional density and recoil energy. So if you wanted to know which has more recoil energy, the .270 Winchester with a 150 grain bullet traveling at 2,950 feet per second or a 7×57 Mauser with a 170 grain bullet traveling at 2,545 feet per second, you would just flip to pages 46 and 47. You’ll find that, with an 8 pound rifle, you’ll experience 17.82 foot-pounds of recoil with the .270 load and 15.07 foot-pounds of recoil energy with the 7×57 Mauser. Or perhaps you want to settle the argument of which has more down range energy, the standard AR-15 or AK-47 load. Just look it up! What the Cartridge Comparison Guide 2 is, and is not. 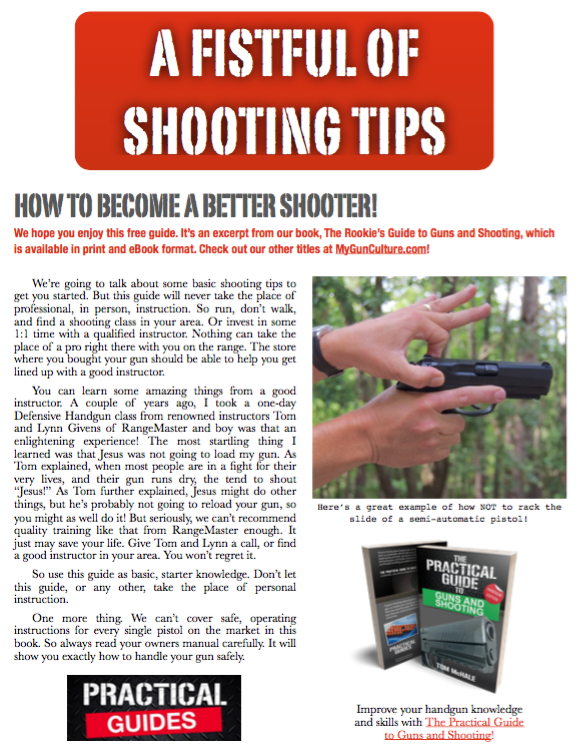 It is not a reloading guide. You will not find powder measure charges in this book. It is comprehensive, covering cartridges from the .17 caliber to the .577 Nitro Express and everything in between. It is not intended to interest Mayor Michael Bloomberg. It is a directory of performance characteristics of factory available cartridges – even really rare and obscure ones. It is not a guide for wildcat and proprietary cartridge performance. It is a means of sucking up hours of your time. Productively! It is not appropriate to bring for dinner table reading on romantic dates. Winner of the Professional Outdoor Media Association Pinnacle Award for excellence, this book is a gold mine of information. You can find the Cartridge Comparison Guide 2nd Edition here. Also check out some of the posters produced by Chamberlain Development, like this American Standard Cartridge poster. It’s painstakingly produced to illustrate each cartridge in actual dimensions to within 4/1000 of an inch.